TUxtra is an online platform specifically designed for students to showcase work to the world – all work, from film, broadcast, written articles, animation, graphics, poetry, engineering projects, everything. To help promote this new website we’re running a competition to showcase student Art – anyone from any course can enter. 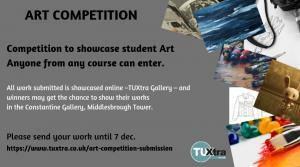 All work submitted is showcased online – TUXtra Gallery – and winners may get the chance to show their works in the Constantine Gallery, Middlesbrough Tower. Due to the popularity of the contest, the deadline has been extended! All work must be submitted by Thursday 20th Dec.